BRATCHENKO, Boris Fedorovich (RU: Братченко, Борис Фёдорович) is the Soviet governmental worker, the organizer of the coal industry within the USSR, the Hero of Socialist Labor (1982). 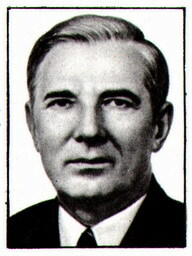 He is the member of the CPSU since the 1940. He is the member of the Central Committee of the CPSU since the 1971. He is the member of the Supreme Soviet of the USSR since the 1962. After the graduation from the Moscow Mining Institute (1935), he worked at the underground mines within the Perm and Rostov provinces, since 1943, he was the director of the mine, the chief engineer of the trust enterprise, of the combined enterprise, since the 1953, he was the deputy minister for the coal industry within the USSR, the director of the division within the Gosplan (Governmental Planning Committee) of the USSR, the chairman of the Karaganda Economic Council. Since the 1961, he was the deputy chairman of the Council of Ministers, and the chairman of the Gosplan (Governmental Planning Committee) of the Kazakh SSR. Since the 1965, he is the minister for the coal industry within the USSR. Bratchenko has contributed the share into the acceleration of the technical progress within the coal industry of the USSR, and into the creation of the highly mechanized coal and petroleum shale enterprises (the underground mines "Raspadskaya" within the Kuzbass region, "Tentekskaya" within the Karaganda city, "Estonia" within the Baltic region, the "Hercules" open pit mine within the Ekibastuz region, and so on), under the governance of Bratchenko, there has been developed the new structure for the management of this branch of industry. He has been awarded with the Governmental Prize of the USSR (1949) for the development and implementation of the powerful coal cutting machines into the coal industry.